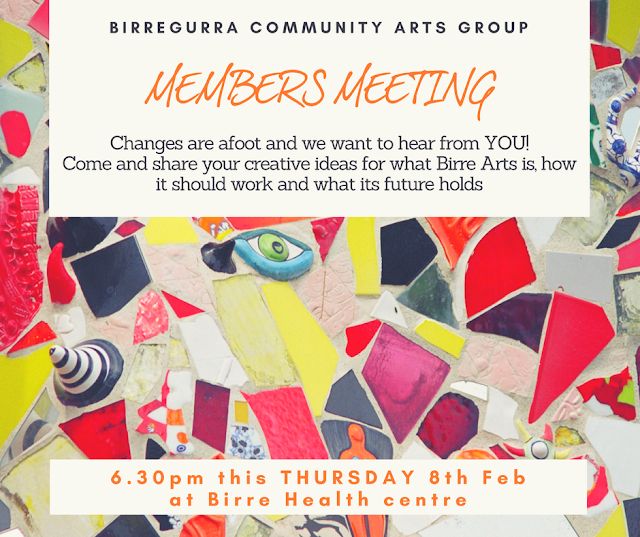 After three fabulous years, it's time for Birregurra Community Arts Group to have a reset! 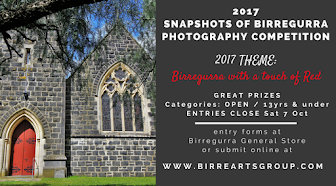 With your help over the past three years, Birre Arts has grown and developed into a remarkable community and has kicked so many goals. Not only have we introduced a regular array of creative workshops and events into the area, and supported the genesis of creative arts groups and projects, but we have made strong networks with other local arts groups, and have started to have an impact on the visibility of arts and culture in the region, particularly with regard to support from Colac Otway Shire. But now it's time for a reset! A look toward what we want Birre Arts to look like in the future. We're looking for fresh ideas for how we operate, what we offer, funding pathways we develop, and how we can better link and promote artists within our region. We want you to tell us what's important to YOU, as an artist or as a consumer of art, and bring your ideas to the table on what and how we can financially support artists and creative projects. And we want you to be a part of how we do all this. So we're throwing a cards on the table and clearing the decks! From how, or if, we run meetings, how we communicate with members, what we support and what we should avoid. Everything is up for discussion - so come along and jump in the ball pit with us and let's see where things land. 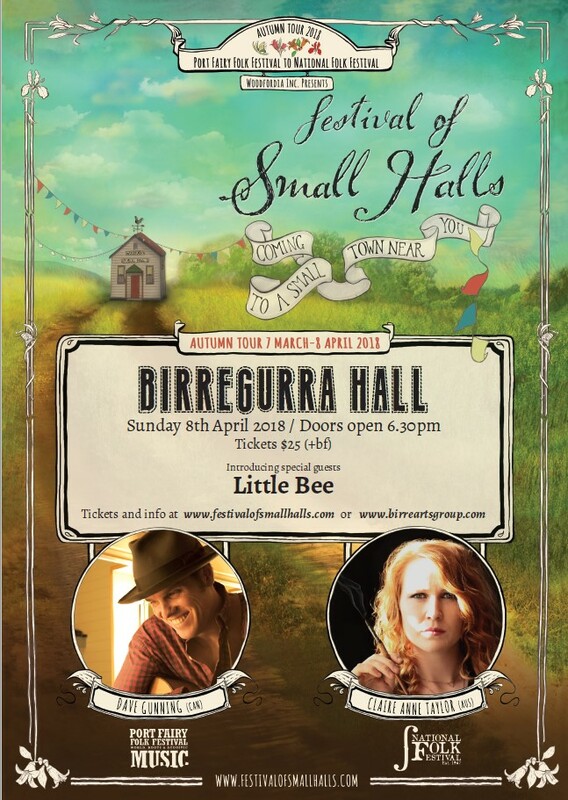 From the East of Melbourne comes Folk duo, Little Bee. In their music, you can hear traces of Norah Jones, The Milk Carton Kids and Tinpan Orange. Their harmonised vocals, Earcatching instrumentation and engaging songwriting creates the foundation for their captivating approach. Bethany Peele and Bryce Turcato formed the group in 2016, forging their musical abilities to create a sound that is warm and unique. Having shared the stage with bands such as Lily & King and Alyce Platt, Little Bee is quickly building a profile in the Melbourne music scene. Crack open your 2018 diaries and get these dates in. 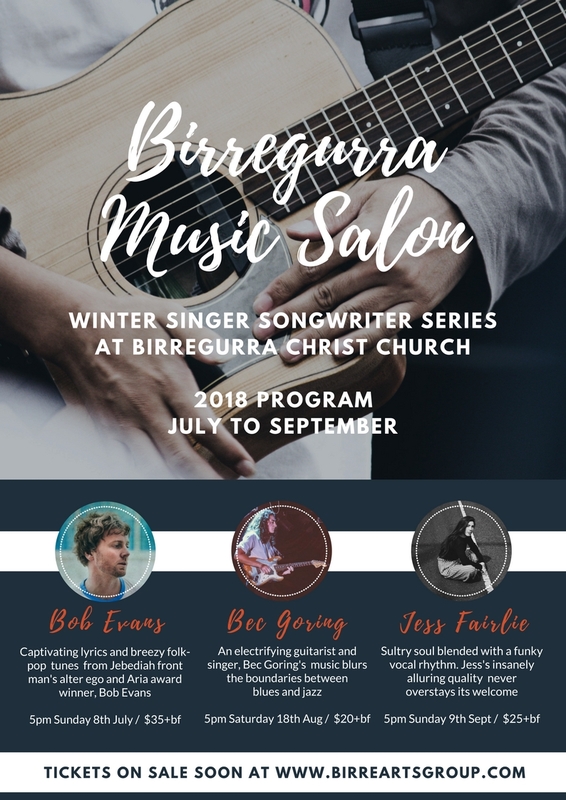 This year's Birregurra Music Salon program is a ripper!! This year (and beyond), Birre Arts is committed to promoting Women in Music and trying to help rebalance the exposure and performance opportunities they get. Did you know that while over 50% of songs in the ARIA Top 100 are from women artists, less than 25% feature of festival line ups - and even less as headline acts. Well, in addition to the fabulous Bob Evans who kicks off the season on Sunday July 8th, we've found two of the most extraordinary emerging female artists that we are soooo excited to introduce you to. 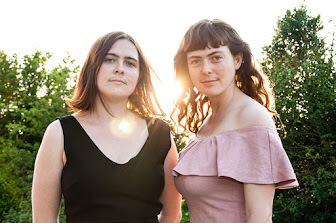 Bec Goring and Jess Fairlie are young and excruciatingly talented with voices that will melt your icy winter heart and take you on the most wonderful musical journeys. These gals are on their way to the big time and we're lucky enough to get them before we can't afford them. 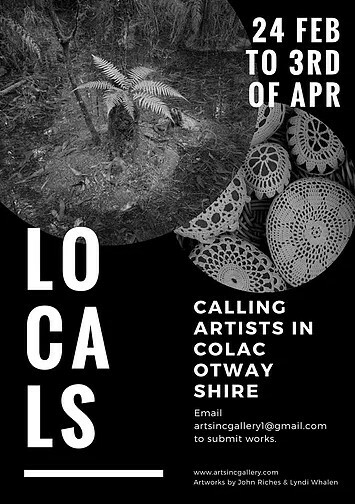 Colac Otway Shire Council aims to create a connected and engaged community with a reputation for supporting and celebrating its artists and creative industries as part of a new draft strategy. The draft Creative Colac Otway – Arts and Culture Strategy 2018-2022 sets the framework for enhancing the liveability of the shire through music, film, visual art, festivals, events and literature. Mayor Joe McCracken said the draft strategy provided a prioritised and costed action plan to guide Council’s future provision of arts, heritage and culture services. “Council recognises the value of arts and cultural initiatives in supporting community cohesion and generating community pride, as well as fostering economic development and tourist visitation,” he said. Quality cultural facilities and community spaces. Activation – increase participation in arts and cultural activity. Support and advocacy of artists and creative industries. Creativity, social cohesion and connections. Cr McCracken encouraged anyone interested in fostering the development of arts and culture to provide feedback on the draft strategy. Electronic copies of the strategy can be downloaded from www.colacotway.vic.gov.au or hard copies can be viewed at Council’s customer service centres and public libraries in Colac and Apollo Bay until Tuesday 13 March 2018. Comments can be emailed to inq@colacotway.vic.gov.au with the subject heading ‘Creative Colac Otway’; or mailed to PO Box 283, Colac, Victoria, 3250. Comments close on 13 March, 2018. Writers Victoria is delighted to announce a new opportunity for an emerging or established Victorian woman writer to join us as a Digital Writer in Residence in 2018. While open to all fiction or non-fiction writers who identify as women, priority will be given to writers facing intersecting barriers to participation in the literary industry, particularly single mothers. The successful applicant will be able to work at flexible times and locations, and there are limited funds for child-care available, which can be negotiated with the successful applicant. Ideas of course(s) that would be of value to you (see here for more details; note: choose courses from late-Feb onwards). Please send your applications to program@writersvictoria.org.au(link sends e-mail) before 9am Mon 5 Feb.
Women writers continue to face many barriers to artistic and professional development, including caring responsibilities, socio-economic status, location and distance to metropolitan areas. This residency aims to support creative practice and enhance professional development in a way that respects the writers’ life circumstances. For further information, please contact Angela Savage on director@writersvictoria.org.au(link sends e-mail) or 0432 697 263 (Mon–Thurs), or Claire Capel-Stanley on program@writersvictoria.org.au(link sends e-mail) or 9094 7840. The Digital Writer in Residence initiative is made possible through a grant from the Loula Rodopoulos Sub-Fund of the Victorian Women’s Benevolent Trust(link is external). Image: by DavidZydd courtesy Pixabay(link is external). 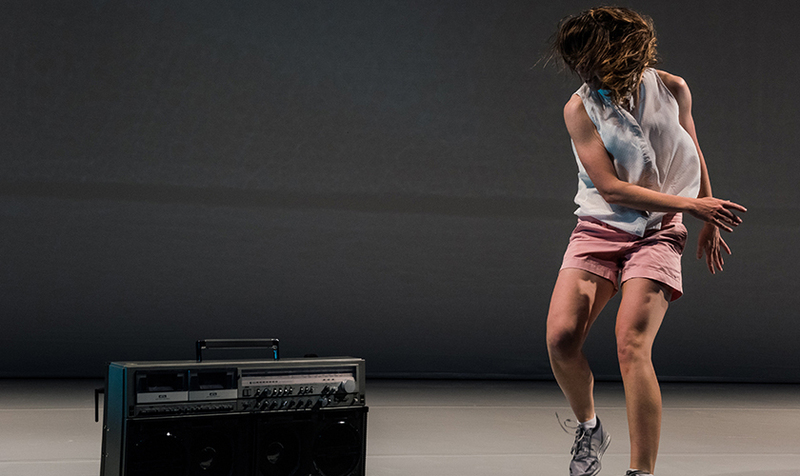 It provides grants of between $5,000 and $60,000 for discrete projects and programs that will develop and bring dynamism to Victoria's arts sector. The VicArts Grants program invests in the creative endeavours and professional practice of Victoria's artists and smaller arts companies. It provides one-off support for discrete projects and programs that will develop and bring dynamism to Victoria's arts sector. The program is open to new ideas, new modes of practice and new approaches to delivery of the arts that will build on Victoria's position as a cultural leader. Download the VicArts Grants program guidelines DOC, 224.5 KB. Applications will be accepted for requests between $5,000 and $60,000. Solo projects (i.e. one artist working alone) are eligible to apply for up to $20,000. The program also includes a 2 year funding stream, providing 2 years of continued annual support to a limited number of successful applicants. To discuss appropriate grant requests please contact program staff. Organisations including arts, non-arts, community and local government. NB: For the July 2018 funding round, applicants must choose between applying to either VicArts Grants or the Creators Fund. For activities commencing after 1 July 2018. For activity commencing after 1 January 2019. It takes approximately 12 weeks from the closing date until funding results are available. COPACC's 2018 Program has been released. Get along to some of these fabulous shows! 08FEB 2018"Rock of Ages" takes you back to the times of big bands with big egos, playing big guitar solos and sporting even bigger hair! 27FEB 2018Strasso’s screwed. He can’t get Chuck and Ted E. off their iPhones. They’re lost to Snapchat, Instagram & Facebook. The battle is on! And in an amazing live-show breakthrough, Strasso throws his voice to 5 puppets at once. It’s a riotously unbelievable, 6-way comedy routine. You seriously won’t believe it!! 17APR 2018Internationally acclaimed vocal trio The Beggars draw together the greatest songs from America, Ireland and Australia in a powerful and beautiful performance that will release recollections of love, family, joy and loss. 26JUN 2018Well known Melbourne ‘60s music specialists, The Substitutes, have handpicked the best artists and songs that you will all know and love: P.P. Arnold, Melanie, Sandie Shaw, Lynne Randell, Lulu, Shocking Blue and Julie Driscoll as well as the giants of the period such as Dusty Springfield, The Supremes, Mamas & Papas, Nancy Sinatra and Joni Mitchell. 29AUG 2018If you cherish the music of the Carpenters, if you long to hear it live again, if you love great singing and lush melodies, then this show is for you! 12NOV 2018November 11, 2018 marks the 100th anniversary of the end of World War 1, the “war to end all wars”. To commemorate this occasion, Promac Productions bring their highly acclaimed Great Songs Of The War Years to Colac. 04DEC 2018Morning Music favourites Melissa Langton and Mark Jones team up with opera and cabaret star David Rogers-Smith to wish you a very Merry Christmas! You’ve never been to Christmas party quite like this! Creative Victoria, The Australia Council for the Arts, Creative Partnerships Australia and APRA AMCOS cordially invite you to an Information Session on funding for Contemporary Music Projects and other related opportunities. You will be able to ask questions about application processes, meet the faces behind the programs and hear what funding and support is available for your projects or practice. Already have a project ready and looking to apply for funding? Want to know what support Creative Victoria, the Australia Council, Creative Partnerships Australia and APRA AMCOS can provide? There will be time available after the session to discuss your projects and plans. Representatives from all four bodies will be available at the following three sessions. To RSVP to any session please call - (03) 8683 3133 or email dean.linguey@ecodev.vic.gov.au by Thursday 8 February. CALLING ALL ARTISTS! - An opportunity from Apollo Bay Arts Inc. Please email artsincgallery1@gmail.com for more info or to submit works for this 6 week exhibit in the Apollo Bay Arts Inc Gallery.